This is the Recount data from Wednesday night's foray into Kara. 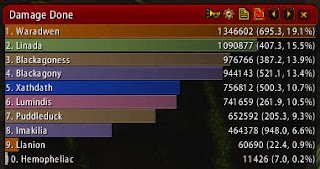 Yes, it is partly to gloat about being #1 in damage done, despite being dead for the entirety of the Maiden fight, but mostly it's to highlight the #2, my friend and guildie Linada, who just hit 70 recently and was on her first Kara run. Nerf hunters, yo! I play a moonkin on Stormscale and am about to launch a blog about being an end-game raiding moonkin. I stumbled across your blog via Google and would love to exchange blogroll links with you. the tower? the tower! rapunzel!